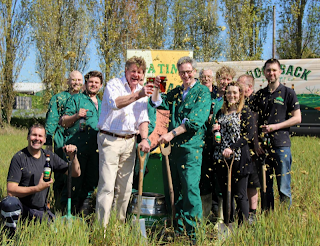 That could be changing though: Hogs Back Brewery has just announced the planting of a 2½ acre traditional hop garden beside its brewery in Farnham, Surrey. It said this is "the start of a larger initiative to link Hogs Back with local raw materials and traditional farming skills," and will make it Britain's biggest brewer-hopgrower. Hogs Back will plant over 2000 hop bines, a combination of the original Farnham White Bine and the newer Cascade variety. Farnham White Bine was the foundation of Farnham’s pre-eminence in hop growing in the 18th and 19th century, when it commanded the highest prices in the UK – at one time as much as 30% more than its Kent neighbours, the brewery said. However, the last White Bine garden in the area was grubbed up in 1929, a victim of downy mildew and cheaper imported varieties. This new White Bine planting stock has been obtained from the National Hop Collection which is maintained by Wye Hops on behalf of the British Hop Association, and has been grown for Hogs Back by specialist grower Stephen Wright at Inghams Farm, Suffolk. It helps that the soil at Hogs Back is ideal for hops, being a deep and high quality loam with a light alkaline chalk overlay. The site is gently sloping on the northern lee of the Hogs Back ridge and well exposed to sun with wind protection from traditional poplar planting. The Hogs Back brewing team will plant and grow the hops themselves, albeit with support from Bill and Bridget Biddell of Hampton Estates who grow all the brewery’s Fuggles hops, used in its flagship beer TEA. The Biddells are 4 miles away on the south of the Hogs Back ridge at Puttenham and will help with picking and drying. Hogs Back said that both White Bine and Cascade will be used in beers that it will launch over the next 12 months, including contract beers for pubcos and a special beer featuring just these varieties. Hogs Back’s Hogstar New English Lager will also use some Cascade from the new hop-garden to replace one of the North American aroma hops currently used late in the boil. “The Farnham White Bine was developed in the early 1700s by a Mr Peckham-Williams of Badshot Place, Farnham, which we can almost see from the brewery," said Hogs Back chairman Rupert Thompson. "It commanded a high price because of its delicate, distinctive aroma and the care taken in growing, picking and packing by the Farnham growers. Hops are influenced by the soil and micro-climate in which they are grown, and we are really excited to bring a local hop of such importance back to its roots, where it was first developed and from which Mr Golding selected his hops to produce the world renowned Goldings. "It will be amazing almost 100 years later – as and when the hop bines are mature – to taste the flavours of such an important raw ingredient in our future beers. It will be wonderful to look out from the brewery and see the raw materials we use growing in the next door field – that’s local! That is part of what makes the craft brewing revival so exciting and we hope to build on this initiative with some further interesting innovations." Larkins Brewery grow a substantial proportion of their own hops. Owner/brewer Bob Dockerty was a farmer before he went into brewing, and several years ago re-planted a couple of his old hop gardens. He is now reaping the fruits of his labours with sufficient home-grown hops to meet most of the brewery's needs. Interesting - thanks. I was pretty sure there must be at least one or two others.